FieldTurf Fields opened on 9/22/06, but work still continues on entry, shelters, garbage can enclosures, field numbers, etc. Lots of finish work still needs to be done. Fields are booked from 4:00 pm - 10:00 pm every weeknight and heavily booked on weekends. Fields are $45/hour. Reflexology Path was supposed to be opened 10/25/2006; the unveiling was officially rained out, but about 20 people showed up not knowing of the cancellation. Birding Loop - East Lake Sammamish Audubon is working on trails and signs. A kiosk is planned for the southeast corner of the Interpretive Lot. New trails may be part of the plan. Sammamish River Trail - East-to-West Connection (Robert Foxworthy) The route for the connector between the Sammamish River Trail and the East Lake Sammamish Trail has not been determined yet at all, although it will go through Marymoor Park. This is one of the remaining missing links in a trail system that will eventually be continuous from Seattle to Eastern Washington. Greg argued for consideration of use of the existing road for some of the bicycle usage. Robert argued for potentially marking bicycle lanes on the existing road, but that would be independent of the connecting trail. All-weather turf baseball infield field #1 - Money is available (from REET - Real Estate Excise Taxes?) to build a FieldTurf infield on baseball field #1. Hopefully, games on the turf field would face far fewer rainouts. It would have a dirt pitching mound, but the base paths would be turf. We raised questions about how a batter's box could be turf. Mixing turf and dirt is difficult. Only one field will be done now, to see how it works. Construction should happen this winter. Rowing Club Facility - City of Redmond permitting issues have delayed utility work. Dog Wash - Agreement should be finalized in about two weeks. Utility work would swiftly follow, as would foundation work. In discussion, Christina raised issues with dog use in the Community Gardens; people austensibly wanting to get to the Pet Memorial Garden. Velodrome building - A project manager on the KC Facilities Management Division side was supposed to be named today. Permitting will be proceeding forthwith, with the goal of completion of the project before the 2007 racing season. Forestry Conference - Michael Hobbs had been supposed to help with one of the presentations at the conference, but he had been delayed getting back to the area and had missed it. However, he was able to relate some comments made by one of the presenters there, who had complained that two of the trees that were removed during the conference probably need not have been removed. There is some difference of opinion within the arborist community about how to decide when a tree is a hazard; Scott's views may be towards the "leave it standing" end of the spectrum. However, there are plenty of arborists who will always say "cut it down". Norah reported that the conference was very well attended and that they were all very busily moving between classes and demonstrations. Star Crossed Cyclocross - a whopping success - 1500+ spectators, ~100 participants. Anne mentioned that it did make a bit of a snarl with traffic. Harley mentioned that the MVA would like to run their season later, which could impact the timing of this event next year. Nokia training trailer - 10/1 - 10/3 - Nokia staged a mobile trailer in Marymoor for a couple of days, and Nokia shuttled employees to take part in training. The trailer was parked on the event pad. Washington DOT initially balked at replacing the sign pointing to Marymoor Park that used to exist on SR-520, saying the they no longer provide signs to things like parks!!! They had proposed that Parks pay an annual fee to have one of those blue Attractions signs. Miraculously, a few weeks ago, they decided that there should be a Marymoor sign. Supposedly they will replace the existing sign for Redmond Town Center with a new one for both the Town Center and Marymoor. The 2007 budget will be essentially unchanged from 2006. Greg raised the issue that we've been pushing to have a tree planting program at Marymoor that would be ongoing and would provide funding for regular planting of trees. The existing trees in the active portion of the park are mostly mature trees, many of which are reaching the end of their life cycle. Group Health Cooperative has responsored the velodrome for another 2 years, and they have raised the sponsorship rate. Harley was clearly excited by this. The 4-year Parks Levy - 4.9 cents per $1000 assessed value - will expire next year. A commission is currently preparing a recommendation for a replacement levy, which would appear on the May 2007 ballot. The Marymoor Community Gardens have contributed 3700 pounds of produce to the foodbank, and more will be donated shortly. A late first-frost will help the growing season. Greg asked about the grant from FOMP to MCG; an invoice is due from them. Christina said it will be forthcoming shortly, probably at next month's meeting. 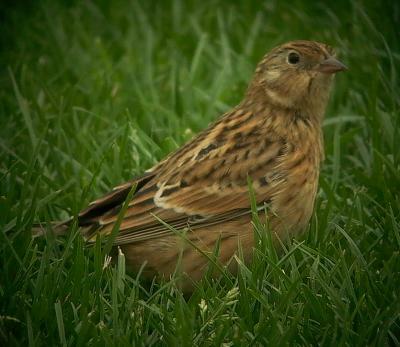 Michael Hobbs shared the news that on August 30th, a SMITH'S LONGSPUR was seen at Marymoor Park. This is a kind of sparrow that breeds in the Arctic and usually migrates through the Dakotas and Texas. This was of especial interest because it was the first time a Smith's Longspur has ever been seen in Washington State. Smith's Longspur, Marymoor Park, King, 8/30/2006. Photo by Ollie Oliver. Next meeting, THIRD WEDNESDAY TO AVOID THANKSGIVING, Wednesday, November 15th.